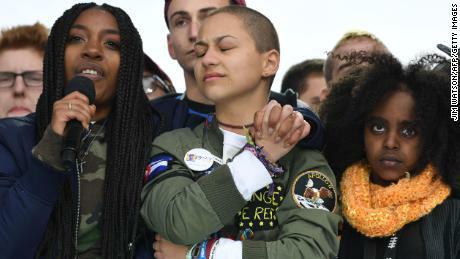 Within days of the February 14 shooting, the students made clear that thoughts and prayers were not enough for them — they wanted concrete legislative solutions to the epidemic of mass shootings and an end to the influence of the National Rifle Association.At a rally in Fort Lauderdale, senior Emma González called BS on politicians who said no law could have prevented the massacre. "Maybe the adults have gotten used to saying 'it is what it is,' but if us students have learned anything, it's that if you don't study, you will fail," González said. "And in this case if you actively do nothing, people continually end up dead, so it's time to start doing something. "Her classmates insisted that the time for action was now, and that could help them heal. They adopted the rallying cry #NeverAgain, and a nascent movement formed. National news outlets descended on Parkland to cover the shooting. They found survivors willing to relive the most terrifying moments of their lives and connect them to policies on gun violence.Seniors David Hogg, an aspiring broadcast journalist, and González, president of her school's Gay-Straight Alliance, remained poised and eloquent as they fielded reporters' questions.Junior Cameron Kasky laid out the stakes in a CNN opinion article: "We can't ignore the issues of gun control that this tragedy raises. And so, I'm asking — no, demanding — we take action now." By February 18, the students put everyone on notice: They planned to march for their lives in Washington on March 24. From the start, they pledged to center students' voices as gun violence survivors and future voters and invited teens across the country to join them. "One of the things we've been hearing is that it's not the time yet to talk about gun control," Kasky said. "So here's the time that we're going to talk about gun control: March 24. "The rally was intended to give students everywhere a chance to "beg for their lives," he said. The march had three primary demands:- Pass a law to ban the assault weapons;- Stop the sale of high-capacity magazines;- Implement laws that require background checks on all gun purchases, including online and at gun shows. A GoFundMe campaign to support the rally raised more than $1.7 million in three days on top of $2 million in private donations from Hollywood personalities including George and Amal Clooney, Oprah Winfrey, Steven Spielberg and Jeffrey Katzenberg.The funds would make the March 24 rally possible, paying for supplies, equipment and coordination of the massive event. As of Sunday, more than 42,000 people had donated nearly $3.5 million to the online fundraiser. While some shooting victims were still hospitalized and funerals were beginning, students boarded a bus to the state capitol for a lobbying day. 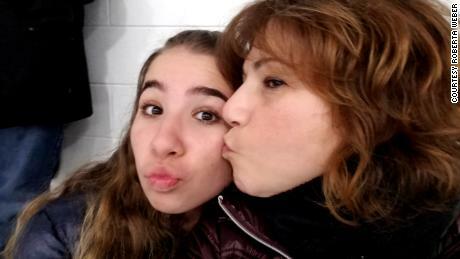 The experience galvanized them in different directions, and many continued to fight along with Stoneman Douglas parents at the state level for stricter gun laws. They didn't get the assault weapons ban they wanted. But they took heart in Gov. Rick Scott's passage of measures opposed by the NRA, such as raising the minimum age for gun purchases. Momentum grew for their cause as companies cut ties with the NRA. At a CNN town hall, they went head to head with Sen. Marco Rubio and NRA spokeswoman Dana Loesch on gun laws. Meanwhile, they continued to put pressure on the federal government to pass universal background checks. On March 14, one month after the shooting, scores of students across the United States walked out of class to honor the 17 victims and make sure that calls for change take into account the broader context of gun violence. "We are standing in solidarity with the youth from the mass shooting, but we also know the repercussions of what's going to happen next could fall on black and brown people," said Keno Walker, who helped high school students organize walkouts in Miami. As #NeverAgain supporters set their sights on the Washington rally, partner organizations stepped up. Giffords, the gun safety advocacy group named for congresswoman Gabrielle Giffords, a mass shooting survivor, provided transportation to Washington for some Stoneman Douglas families with the help of New England Patriots CEO Robert Kraft, who provided the team's jet to help families get to Washington. Other Stoneman Douglas students traveled with families and friends to the march. Senior Julia Bishop said she chose to attend the rally in Washington in order to "feel the heart of support" contained within the movement. "I wanted to stand on Capitol Hill in the shadow of our country's legislature and express how truly enraged I am that my friends are now dead due to gun violence and there had been nothing done about it. "Everytown for Gun Safety supplied operational and logistical resources for marches in Atlanta, Chicago, Columbus, Ohio; Dallas, Denver, Las Vegas, Milwaukee and New Orleans, the group said Sunday. Additionally, the organization said it gave out $5,000 grants to more than 200 local organizers across the country to ensure they had operational resources. The group helped to support transportation for students from cities including Boston, Baltimore, Chicago, New York City, Pittsburgh and Philadelphia to travel to the march in D.C. Ben and Jerry's also chipped in with grants to fund bus transportation to the march.For entertainment, Miley Cyrus, Ariana Grande, Jennifer Hudson, Common, Demi Lovato and Vic Mensa committed to performing.Meanwhile, people in the nation's capital lent a hand. Eleven mothers from metro D.C. banded together to find free housing for participants from out of town. Chef José Andrés' ThinkFoodGroup and various DC restaurants offered free and discounted food to student marchers. The day before the rally, Stoneman Douglas senior David Hogg said the media's biggest mistake while covering the school's shooting was "not giving black students a voice." When they took the stage at March for Our Lives, Hogg and his classmates made sure to not make the same mistake. Speakers from Chicago, Brooklyn and Los Angeles also appeared onstage to describe how gun violence affected their communities. "We recognize that Parkland received more attention because of its affluence," Jaclyn Corin, a survivor of the Parkland shooting, said in her speech. "But we share this stage today and forever with those communities who have always stared down the barrel of a gun. "Corin was joined onstage by Yolanda Renee King, Martin Luther King Jr.'s granddaughter. The 9-year-old said that like her grandfather, she too has a dream, in which "enough is enough." Naomi Wadler, an elementary school student from Virginia, said she was speaking on behalf of African-American girls "whose stories don't make the front page" of national newspapers. The students invited others to join them and provided a toolkit to help people organize their own marches. More than 800 groups marched in cities across the US and internationally, including in London, Madrid, Rome and Tokyo.In Boston, Marjory Stoneman Douglas High School graduate Leslie Chiu said the march was about gun violence in general, not just school shootings. "This is not just in Parkland," she said. "It is in every community, especially those of color. … This is not a moment. This is a movement." A plane carrying Melania Trump was forced to land after a "haze of smoke" was spotted on board, acco..
6:05 PM 01/02/2019 | Politics Benny Johnson | Columnist, Viral Politics President Donald Trump cr..